The Real-time Analytics module displays the data visualizations of data captured or stored in the Cloud. 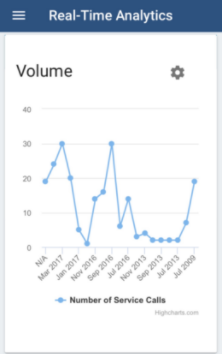 These data visulizations (charts, graphs, etc) are configured using the Analytics & Reporting application, and can provide users with data suited to virtually any purpose. Once configured, this data refreshes automatically when the mobile app has been synchronized.